THERE CAN BE ONLY JUAN: Basiliciousness part two! Zoesh about 8 tomatoes in a food processor and then simmer them on the stove for ten minutes with some salt. Top with a mini gluten-free "toastie" (recipe below), which are just slices of day-old homemade potato flour scones drizzled with olive oil and grilled till crispy in the oven. (Crumbled cream crackers, croutons or melba toast would make a great substitution if you're blessed enough to be able to eat gluten). This recipe comes from a TV show which used to air on South African TV when I was little called "Kideo", presented by the lovely Natasha Sutherland (the ex-wife of that philandering, ridiculously corny singer, Steve Hofmeyr) and a talking donkey puppet called Mr Chinwag! You cannot ask for a simpler, more reliable recipe, which makes soft, delicious scones when baked with cake flour. Obviously, having to de-glutenise the recipe changes things a little. (if you're using normal cake flour made from wheat OR a gluten-free cake flour mix which you can substitute cup-for-cup, follow recipe as is. However, if you are using only potato flour, you will need to allow for about 1 cup of milk or just over). Beat egg & mix all ingredients together with a spoon. 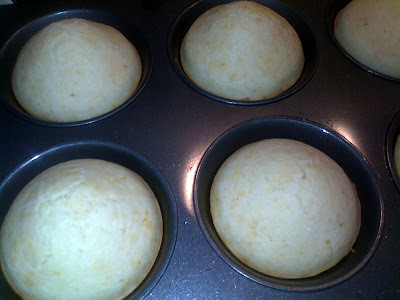 Bake in a buttered cup-cake pan for 12 - 15 minutes (or till golden) at 175 to 180 degrees Celsius. ps: I always admire your choice of words as well!